Auto On/Off Dust Extraction for professional users – plug your tool into the Karcher & it starts automatically when the tool is on. Delayed turn off 12 seconds to clear all dust from the vacuum hose. 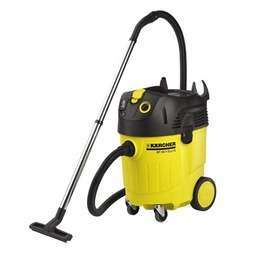 The NT 45/1 is a handy and strong wet/dry vacuum cleaner for commercial applications. It is equipped with the innovative and patented TACT-System for fully automated filter cleaning. The NT 45/1 Te is additionally equipped with an on-board socket and automatic start/stop. With this function the vacuum cleaner can be telecontrolled by a connected power tool. In addition this version provides a stepless adjustment of the motor revolutions. The NT 45/1 provides a full range of accessories that can easily be retained in the integrated accessory storage.